"Are you going for a ride this morning?" Many of the Chain Reaction riders will have heard that question many times before. "Oh, it's looking very windy" or "Nah, it's looking like it will rain fairly heavily" are stock phrases that many Chain Reaction riders will have employed in response to those questions. There is no such luxury of choice on a Chain Reaction ride. When you wake at 3am because the sound of the rain on the roof of your hotel is so intense it disturbs the sleep of the dead, which is the sleep that overwhelms you after a day like yesterday, all you can do is hope that by the time you ride out in the morning the rain will have stopped and the skies will have cleared. No such luck today. 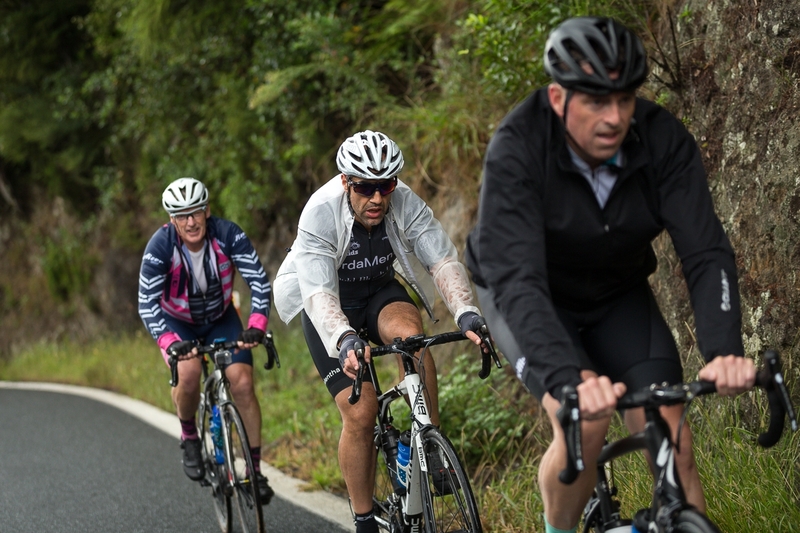 We rolled out of Pauanui in the softest drizzle. By the time we reached the base of our first large climb the spots had become larger. It was proper rain by the time we reached the summit, greasing the road and fogging glasses. It was bucketing down, leaving sheets of water on the road, as we descended. By the time we got to our first drinks stop at Whangamata the rain was torrential. We might as well have turned left instead of right leaving Pauanui, and swum there. We were only 25kms into a 150km day. We had done maybe 20% of the day's climbing. We were all looking grimly down the coast, wondering what was to come, and wondering whether we might find a toilet block in a park somewhere where we could huddle to keep out of the rain at lunchtime. We pressed on. The rain continued. Allegedly, we passed the Te Ramaraua Scenic Reserve. Happily, after another descent, down gravelly, oily, sketchy roads, the rain started to clear. The clouds rose from the pastureland, revealing tree ferns taller than telegraph poles and rolling fields chock-full of cattle with the craggy Coromandel range behind. 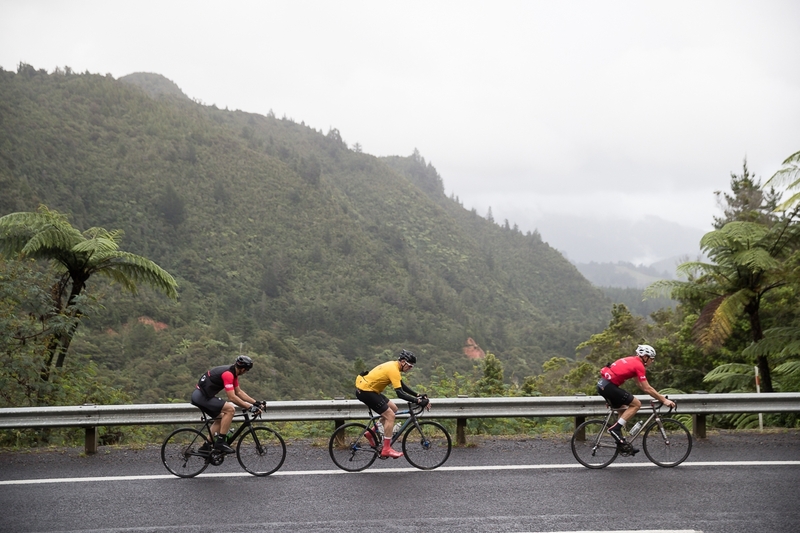 By the time we rode past Waihi Beach, headed for our lunch stop on the Bowentown isthmus, which hems in Shelly Bay, the sun had at last cracked the clouds open. It was glorious. 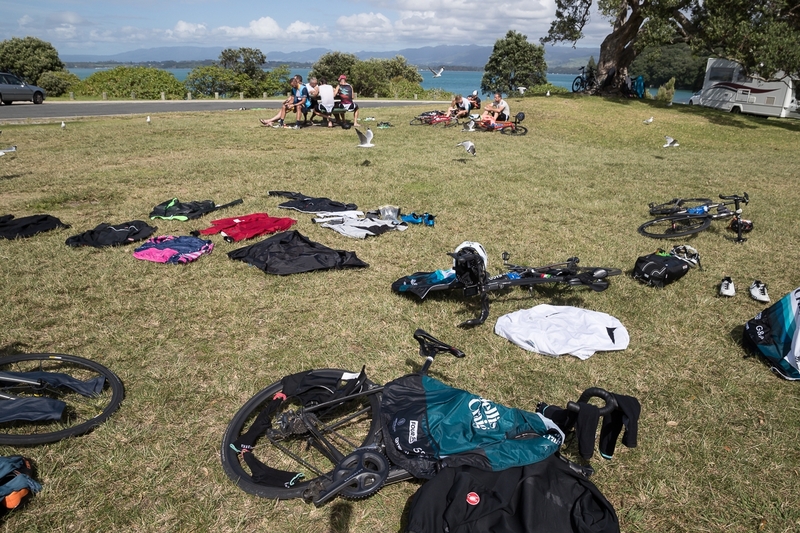 Riders dropped their bikes, stripped off their sodden clothes and draped them over park benches, bike frames and trees. The day had turned, in an hour, from ridiculous to sublime. Our support crew were - again - fantastic. The food was laid out in an instant, no request was any trouble, bikes and bodies were attended to. I spoke to one new rider during lunch and asked him how he was enjoying his first Chain Reaction. He said it was magnificent, exceeding his expectations, and particularly so because of the care and attention to every detail and the paramount concern for rider safety. Here are just three examples from today. 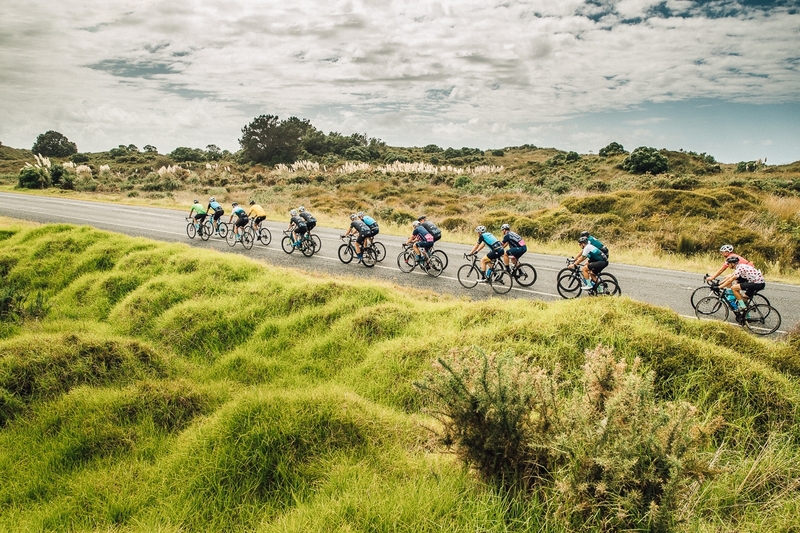 • First, we were due to do a team time trial at Waihi Beach. 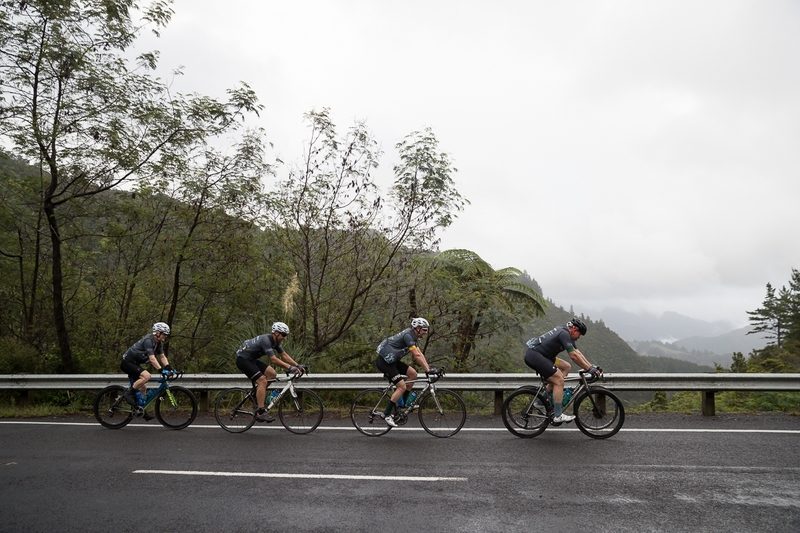 However, because of the conditions yesterday and this morning and the toll they'd taken on the peloton, Macca, our coach, and Tim, our ride director, postponed the time trial, only for safety reasons. 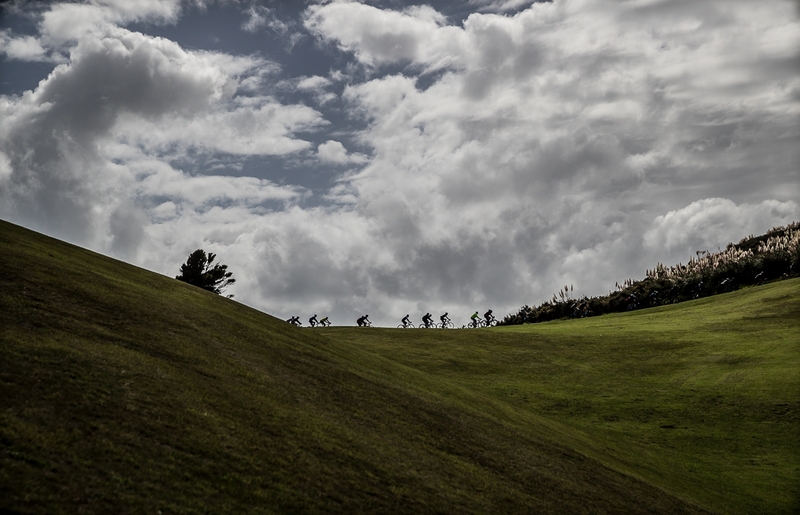 There was no opposition from the peloton. • Second, every rider in the peloton was massively impressed with Cindy Carle's roundabout work in the latter half of the day, as we battled the traffic. From logging trucks to caravans to Ford Fiestas, nothing gets past Cindy until Cindy says so. 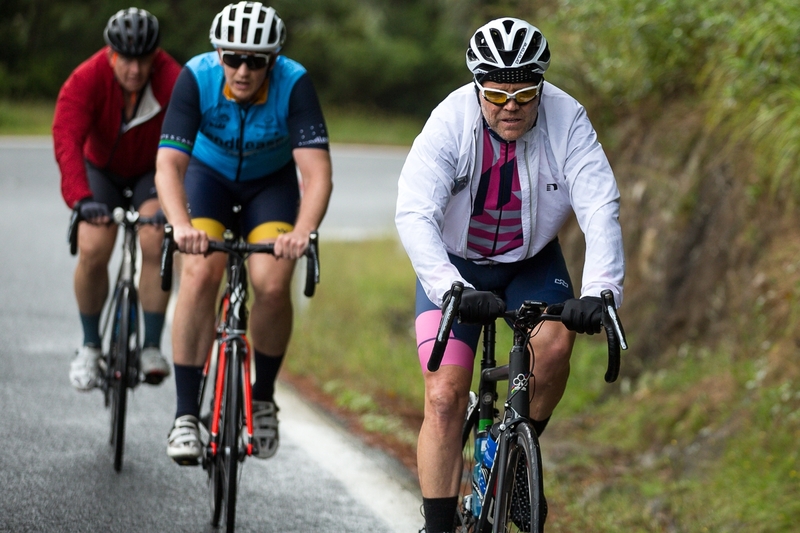 • Lastly, I'm not sure how many riders noticed Johnny Wurtz, one of our massage therapists and soigneur extraordinaire, quietly going around at our last drinks stop, clicking all the bikes into their easiest gears, for the tight climb out from the beach and back to the main road. During the afternoon we had to come down the highway to Tauranga, one of the busiest roads in New Zealand, streaming in single and colourful file, 300m long, in the left lane of the highway, past Kiwi fruit and avocado farms and wind-blocking hedges which are a marvel of nature. The last drinks stop was at a Pahoia Beach in Tauranga Harbour, a gorgeous, majestic spot. The landscapes here are huge. 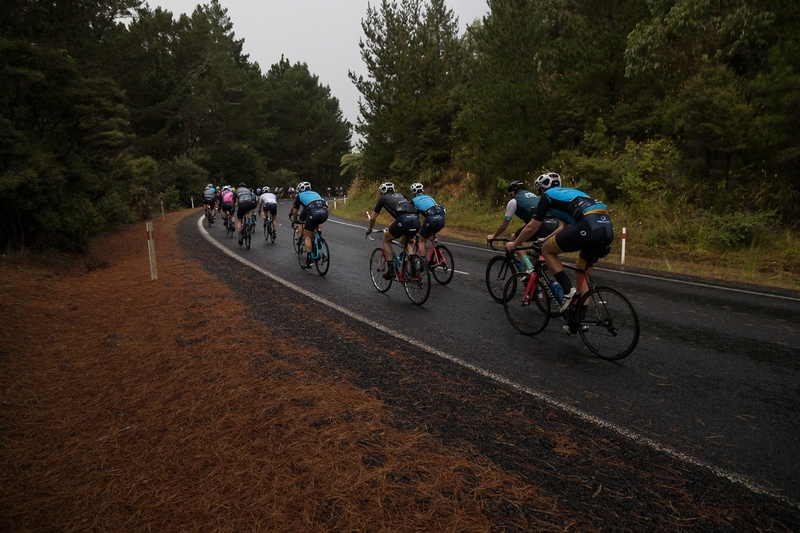 From there we covered our last 25km swiftly, riding through the main street of Tauranga to the usual set of interested, congratulatory and bemused looks and comments from the locals. Today's yellow jersey was Justin McDean, from the Henley team, new to Chain Reaction. 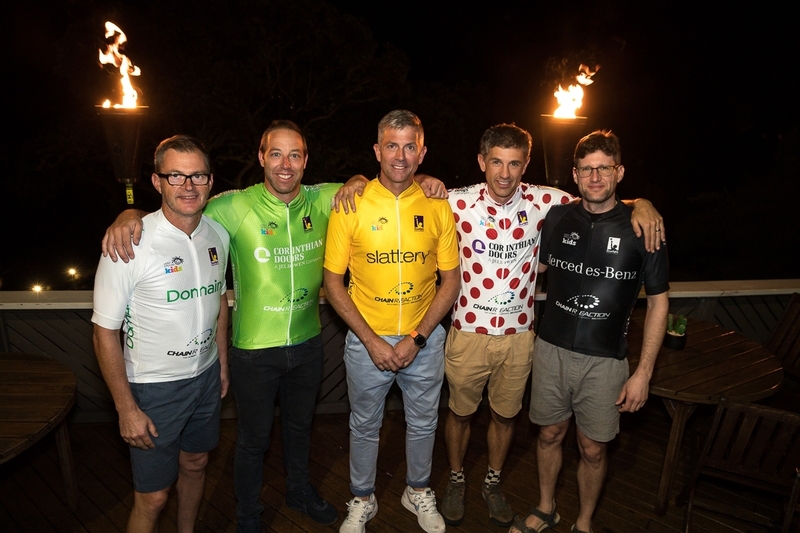 Those gents really know how to ride and really know how to fund raise. Justin was roped into the team, and into riding to get fit for this event, about four months ago. He's excelled himself. 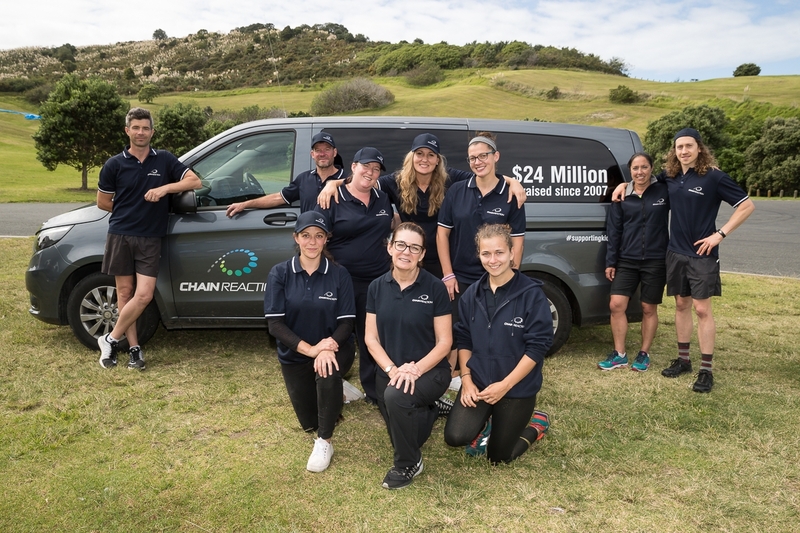 Through his network and contacts he pulled in approximately $170,000 of sponsorship for the Henley team, and Chain Reaction, a remarkable effort. The green was worn today by Tom Paul, full of smiles and speed down the hill. Ben Patrick, who just loves going up the hills, was fittingly in the polka dots. Kris Symons, a four time rider, and Big Show stalwart, wore the black, and newbie Jonathan Height did the white "young rider's" proud. Tomorrow, we continue down the coast of this remarkable place, the North Island of New Zealand, ending in Rotorua. If the rain stays away, it promises to be a great day.